Aug – Fundraiser concert for St Aiden’s Presbyterian Church, Northcote. May – Donors’ Service of Thanksgiving, Holy Trinity Cathedral, Parnell, Auckland. May – Donors’ Service of Thanksgiving, Holy Trinity Cathedral,Parnell, Auckland. Nov – Heaven Bent’s 20th Year Concert and Celebration. Ponsonby Baptist Church. Former members and conductors attended this rousing event and fun party. Sept – The inaugural VoCo concert, featuring Heaven Bent and 7 other choirs/vocal groups. Holy Trinity Cathedral, Parnell, Auckland. Aug – Sing Out Gospel, concert at Michael Park School Auditorium, Ellerslie. Dec 12 – End of Year Concert at Ponsonby Baptist Church, Ponsonby. Aug 22 – Living Gospel, concert at Michael Park School Auditorium, Ellerslie. May 23 – Fundraiser at Christ Church Warkworth, with first half performed by Kai Rhythmix and Mahurangi Senior College Choir. May 17 – Donors’ Service of Thanksgiving. Holy Trinity Cathedral, Parnell, Auckland. 29 Nov – End of Year Concert – Baptist Church, Ponsonby. 13 Nov – The Day Madiba Came. A celebration of the visit to St Matthew in-the-City by Nelson Mandela, and of the end of apartheid in South Africa. 26 July – Fundraiser concert for St Aiden’s Presbyterian Church, Northcote. The set list was divided into newer songs in the first half (after which everyone enjoyed a delightful afternoon te supplied by parishoners) while the second half featured excerpts from the choir’s successful March to Freedom show. May 17 – The inaugural Auckland Choral Celebration took place on May 17 playing to a full house. Organiser Helene Piper, who also conducted the Devonport choir, deemed the event a great success and plans to make the event an annual one. Stellar Singers, Devonport Community Choir and Heaven Bent each performed a 25 minute set before coming together to sing Leonard Cohen’s signature tune Hallellujah. April 6 – “March to Freedom”. Titirangi Music Festival. The Civil Rights movement was fuelled by songs, many of them contemporary expressions of older spirituals from the African-American choral tradition that arose out of slavery, a tradition recognised as one of the most profoundly moving bodies of music in the world. Songs were adapted or completely re-written as people, both black and white, took up the cry against segregation and oppression in the US southern states during the 1950s and 1960s. To commemorate this anniversary year, Heaven Bent Gospel Choir created March to Freedom, a concert featuring freedom songs from the American Civil Rights movement, with new arrangements and specially-created harmonies by the Auckland-based choir’s musical director, Phil May. March to Freedom included linking narratives and images from this unique period of history, marked as it was by the philosophy of non-violent protest. November 9 – “March to Freedom”. All Saints Anglican Church, Ponsonby. The choir’s first public performance of this moving concert played to a full house and was warmly received. July 6. Fundraiser for St. Aidan’s Presbyterian Church, Northcote. January 28 – Anniversary Day at the Viaduct Centre saw the choir perform at the Blessing of the Fleet ceremony. The National Anthem – in both official languages – was followed by Fa’afetai. October 27: Country and gospel music fans were treated to an evening of songs ranging from heart-throbbingly beautiful to joyously foot-stomping when internationally acclaimed country diva Donna Dean returned to Auckland for a one-off gig with Auckland’s Heaven Bent Gospel Choir on 27 October. As well as being the launch of Donna’s new album, Tyre Tracks & Broken Hearts, the concert premiered the gospel choir arrangement of Pray, one of the songs from Donna’s 2011 RIANZ awarded Best Country Album What Am I Gonna Do? October 25: Heaven Bent perform two songs on TV1’s Good Morning to promote the choir’s joint concert with Donna Dean on 27 October. See photos on Photo Album page. August 2012: Heaven Bent were joined by VoxPop, Next Offramp and Nets of Glory to raise funds for City Mission. The concert was also a public farewell and thank you to Tony Backhouse who has been a guiding force in a cappella gospel music in Australasia for the past 15 years. July 2012. Australian gospel choir “The Glorious Mudsingers” joined forces with Heaven Bent and OneVoice choirs in a charity concert to raise money for Christchurch. The Muddies added all takings from their 10-gig tour to make a combined total of over $4000. March 2012: Choir performed first half of joint concert with gospel group Heavenly Lights Quartet. 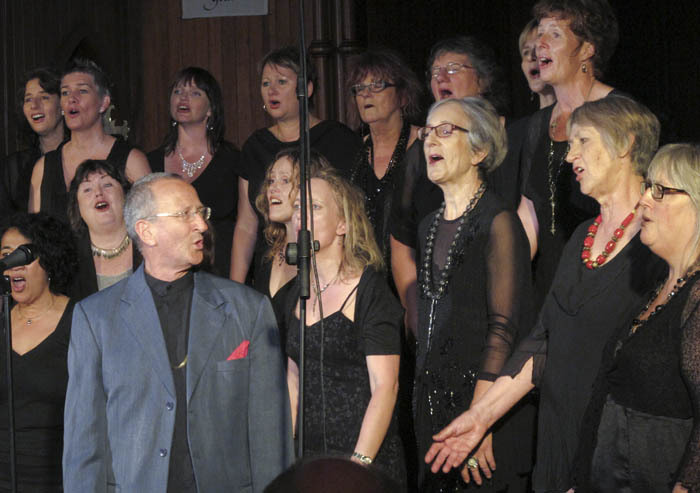 November 2011: Full concert at Devonport to end the year and mark the Choir’s Birthday. Mentor Tony Backhouse sang lead vocals on four songs. Details of earlier concerts can be found on our HISTORY page.